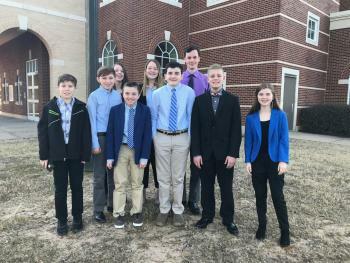 Congratulations to our FBLA students who represented GMS at the District V Conference! Our FBLA Club was also recognized by JDRF & Arkansas Children's Hospital for our fundraising efforts. The BIGGEST News is that we now have the new District V ML-FBLA Reporter...LUKE DUNLAP! Eric Huett did an awesome job introducing Luke on the spur of the moment! We are SO PROUD of all of our FBLA members for their hard work & dedication, way to go GMS students! Also, a huge thanks to Mrs. Burgess for working with our students & preparing them for the future!